I don't do a lot of competition posts but I've been tempted by the prospect of a night in at Stanley House, a luxury hotel in the North West of England, with breakfast, dinner and spa treatments included. Anyone who knows me, knows I love an overnight in a hotel with spa treatments. 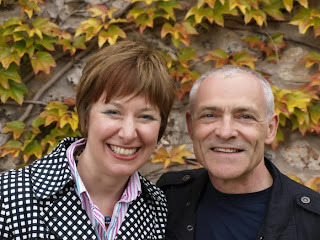 Brian and I have been married for 32 years, the photo above is from 2011 which was our 30th Wedding Anniversary and is taken outside the hotel where we had our wedding reception. To enter this competition you have to write about your dream wedding menu which really got me thinking. At our wedding, so long ago, I went for simplicity. As it was June, I chose traditional Scottish summer dishes: a whole side of poached salmon served cold with a buffet, followed by Scottish strawberries and cream, to be honest I can't remember much else about the food. I didn't want a big wedding, just family and a few close friends, it was all very informal. For my Dream Wedding Menu, I would still choose beautiful fresh Scottish produce, but this time it would be a slightly more formal dinner, for a slightly different group of family and friends as many of those invited to our wedding are no longer with us. There is a little smokery in the East Neuk of Fife where they smoke Langoustines straight from the boat. I was born and brought up in north east Fife where we always had access lots of very fresh fish. These Langoustines are totally delicious, they need no more than to be served simply, as above, with lemon and accompanied by slices of brown bread and butter. A fresh, sharp Sauvignon Blanc would be the perfect accompaniment to this first course. 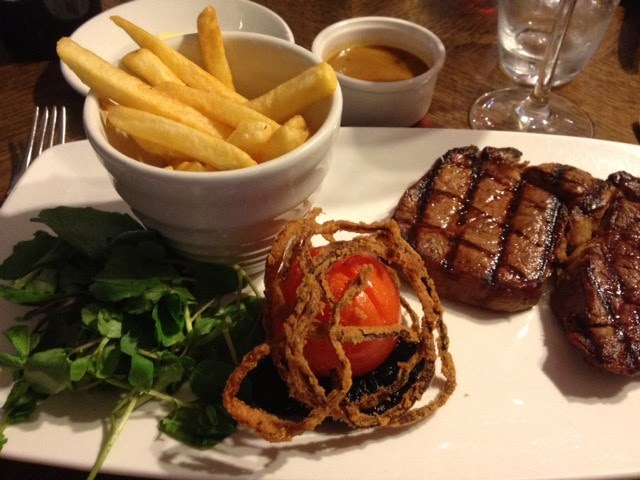 For the main course, it is hard to beat a tender piece of Aberdeen Angus Steak cooked to perfection and served with a peppercorn sauce, crisp onion rings, roasted tomato and fries. As beef farmers, albeit part-time, we would want to support Scottish Beef. The wine served with the steak would be a warm, but not too heavy, red. Most likely our favourite Italian red, Montepulciano. 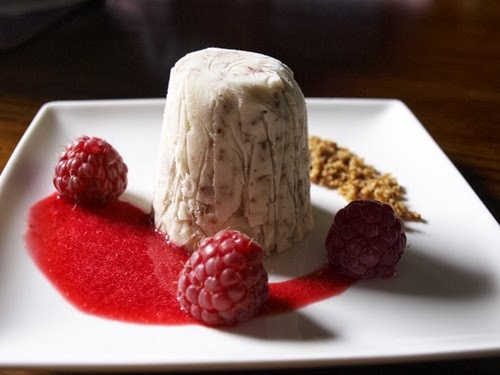 To finish we would serve Iced Cranachan with Tayside Raspberries. Cranachan is a mixture of cream, toasted oatmeal, whisky and honey, this iced version is one I made for the Scottish round of Best of British. I served it with beautiful rasps from Tayside, where the best raspberries are grown, a raspberry coulis and some toasted oatmeal. As the dessert contains some whisky, a 'wee tot' of malt whisky would be served to those who like it, with an alternative of a cream whisky liqueur for those with a sweeter tooth. 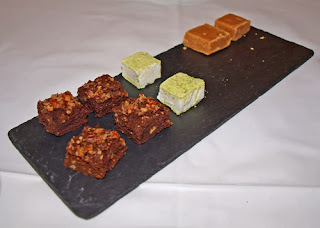 I would finish with coffee and petit fours including traditional Scottish tablet, that sweet melting confection that isn't quite fudge. It's a childhood memory, and always the first thing sold out at of fund raising events, we love it. I hope you enjoyed reading about my Dream Wedding Menu, I certainly enjoyed fantasising about it! 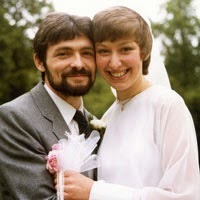 Oh congratulations to you on your 32 years and here's to many more. Your dream wedding menu sounds perfect to me, hope you win! Lovely photographs of you and Brian, both then and now - or nowish! Your menu photographs are fantastic too. Crossing fingers that you win.